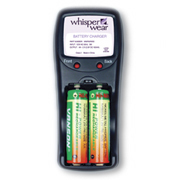 Stop throwing away batteries and save money by using these memory-free, rechargeable batteries with your Whisper Wear Breast Pump. Kit includes ultra-compact charger and 4 Ni-MH batteries, which can be charged two or four at a time. Powers all Whisper Wear Breast Pumps. Having two battery kits will allow you to keep a set charging while using the other. The WW pump works more efficiently when the batteries have a full charge.